The Alice Springs Kennel & Dog Sports Club (ASKDSC) is the oldest dog club in the Northern Territory. We are a small club of dedicated dog enthusiasts who work hard together to ensure pure bred dog fanciers are able to enjoy showing despite our isolated location. 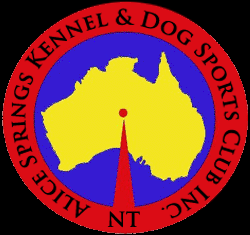 In July 2011 the club name was changed from Alice Springs Kennel Club Inc to Alice Springs Kennel and Dog Sports Club Inc to expand club activities and promote responsible dog ownership. ASKDSC believes that owning a dog is more than just breeding and showing, so will include training and dog sports activities for the benefit of members. The club is still fine-tuning exactly what will be offered, and information will be posted to the ASKDSC Facebook page immediately it is available. ASKDSC aims to hold 20 Championship Shows per year and 13 have already been held in 2011. This is quite an undertaking with limited entries and having to fly in and accommodate all our judges. We are fortunate to have the support of several wonderful sponsors, who help make it all possible.